Thank you for the wonderful support that you have shown towards my daughter Megha. She is doing better now compared to earlier and is undergoing dialysis regularly. She had developed a few complications and was hospitalised for 4 days. Once her health stabilised the doctors discharged from the hospital. 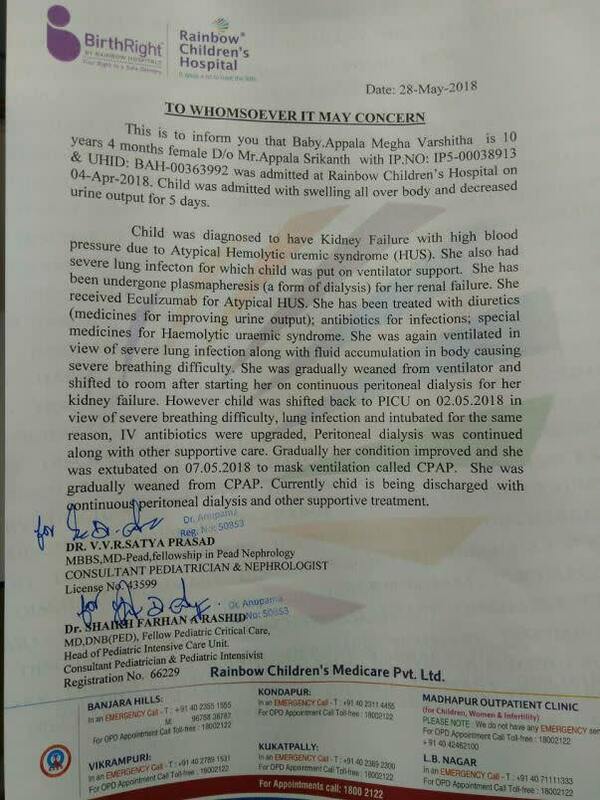 At present, she has been advised to undergo regular dialysis. The doctors will be able to suggest the future course of action based on her health and speedy recovery. Thank you for the wonderful love and support that you have shown towards Appala Megha. She is doing better now compared to earlier. Her health has stabilised and her vitals have also improved. Based on her health and the reports from the tests conducted, we will be discharging her from the hospital today. She has been advised to continue with medication and peritoneal dialysis. She might be needing a kidney transplantation in the future but at present, she is doing good. Her father wanted to share a message with all of you, which has been attached below, "I saw my daughter and wife smile today. I just do not have words to express my gratitude to everyone. You are the reason behind this smile. I had lost all hopes when the doctors explained to me about the ailment and I had nowhere to go, I had knocked on every door I possibly could. The doctors, Milaap, the Donors and all the well-wishers came as our ray of hope during the storm. I have just one request/wish for which I am praying right now is that God bless you all abundantly and you prosper for the rest of your life. I just could not wait to convey my thanks once the doctors informed me that she was going to be discharged. Thank you once again", Srikanth, Appala Megha's father. Thank you for the wonderful love and support that you have shown towards Appala Megha. She is doing better now compared to earlier. Her health has stabilised and her vitals are also showing improvement. Based on her health she has been shifted from the ICU to the room. She is currently undergoing dialysis on a regular basis and if she recovers at the current pace, she can be discharged in a few days. I would like to thank you all once again. Please do pray for her speedy recovery.